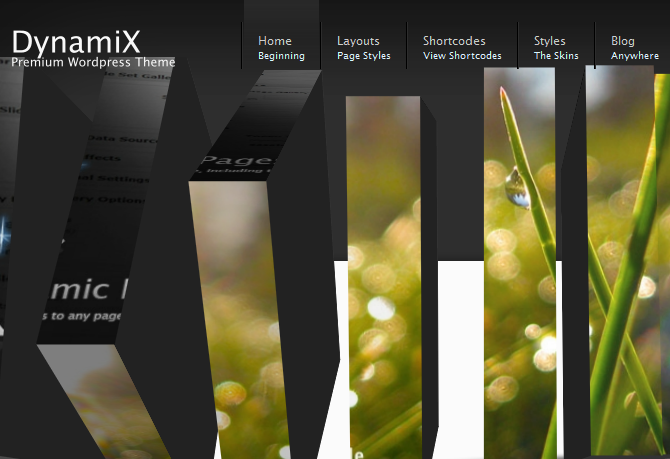 May 28th in Premium Themes, Themes for Businesses by Wordpress Jedi . 1. Divi: a smart theme with 18 pre-made layouts and the Divi Builder, allowing you to customize how your site looks. It has a responsive design. You can use this theme for all kinds of websites. 2. 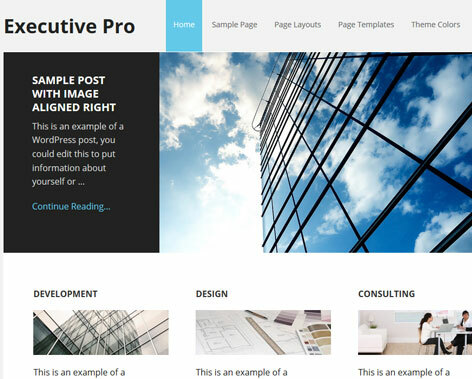 Executive Pro: an elegant theme with 7 color styles and 3 layout options. It lets you customize its header and background conveniently. The theme features HTML5 markup and a responsive design. 3. Nova Theme: a great looking theme for startups, agencies, and other small businesses. It has 6 color schemes and offers automated thumbnail resizing. ePanel makes it easy to customize. 4. Enterprise Theme: has a clean and highly customizable front-page with 5 unique color schemes for webmasters to choose from. Its back-end can be used to manage navigation, SEO, analytics, and ad settings. 5. DynamiX: it has 20 outer skins and 2 inner skins. It takes full advantage of jQuery to bring a more dynamic experience to your website. 6. Essence: comes with 7 inside page layouts and a static home page. Very dynamic and clean. 7. eBusiness: a very dynamic theme for eBusinesses. What I like about this theme is the powerful backend that allows you to change things around without having to write a line of code. It’s cheap too! 8. Cubit 6 in 1: comes with 6 different cholor schemes, multi level menu, breadcrumb navigation, post pagination. A very dynamic theme. 9. Quoan Business: a classic corporate theme that is not only lightweight but very easy to customize. You can also use it for a business blog. Multiple layouts are available. 10. 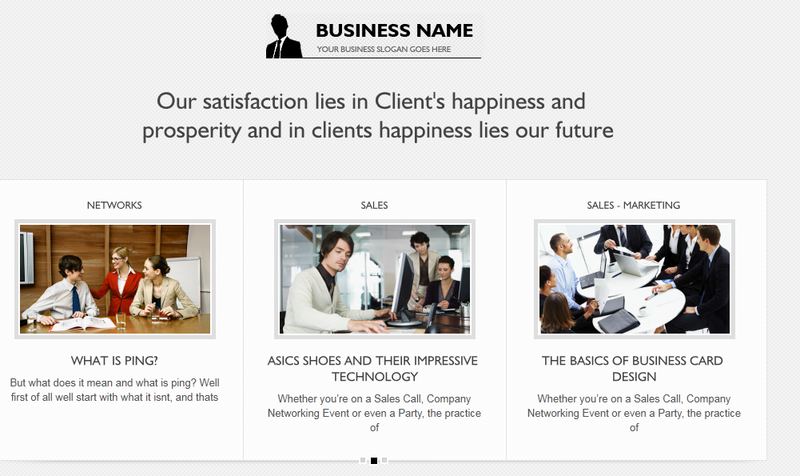 Strict Business: an elegant business theme designed for cutting edge startups and technology small businesses. Very lightweight and looks great too. 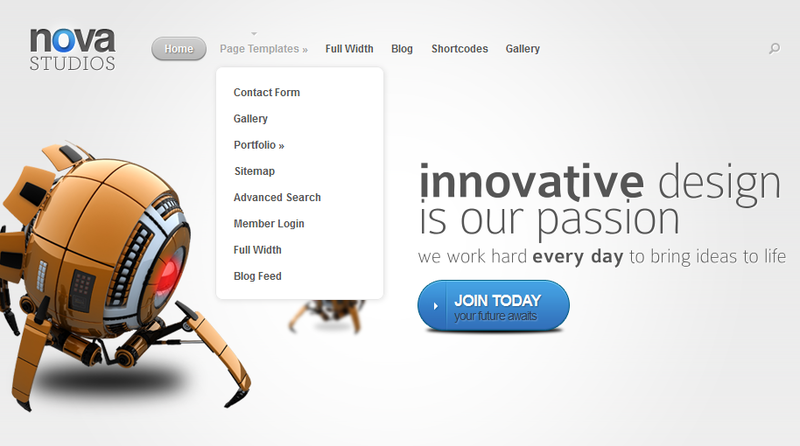 11. Business Theme: Business theme is another highly flexible corporate theme for WordPress. Comes with multiple layouts and a color chooser. You also get page-based homepage for maximum SEO effect. 12. Titanium: Titanium is a traditional business theme for WordPress that comes integrated with video. It’s social media ready too! 13. Function Plus: comes with Flash front-page, auto-zoom thumbnails, dropdown dynamic menu, and featured content gallery. 14. One Theme: One Theme is very flexible, easy to customize, and comes ad ready. It’s also optimized for organic search. 15. Omni Theme: Omni Theme is very light and clean and comes in 5 colors. It’s like buying 5 themes. 16. ColdStone: Coldstone comes in multiple colors and a sophisticated back-end that lets you change things around without having to write a line of code. 17. Flixiness: a social media ready corporate WP theme. You also get PSD files to customize your theme further. 18. Universum: a cool business WP theme. Comes with dynamic menus and valid CSS/XHTML code. 19. Silver Business: another cool looking business theme for WordPress. Lightweight and easy to setup. 20. Corporate Blue: a very simple and lightweight small business theme for WordPress. Comes ad ready. 21. Productum: comes with 11 cool color schemes, 6 widgetized areas, and is social media ready. Productum is a great WordPress theme for startups. 22. The Company: a standard, simple corporate theme for WordPress. It’s very clean and easy to customize. Just change the logo, customize the theme, and you are on your way. 23. Over Easy: Comes with a Web 2.0 look and feel. Perfect for any startup or innovative company. 24. Nostra: Nostra is a Business WordPress theme that comes with NattyWP widgets and is very lightweight. Good choice for small businesses. 25. EasyTouch: EasyTouch is another lightweight corporate theme for WordPress. It’s easy to modify and very convenient to set up. 26. Ardmore: set up your business website, upload your logo, add your images, and you are ready to go! 27. Architect: Architect is a very dynamic, dark corporate theme for WordPress. It’s very clean too! 28. iCompany: comes with an integrated blog. Clean code. Optimized for search engines. 29. Alpha Group Inc: comes with built-In theme options menu and auto-zoom thumbnails. It’s also very easy to customize. You can change your layout easily as well. 30. Vanilla Sky: VS has a magazine look and feel to it, but is perfect for small businesses and startups. It’s easy to customize and very flexible. 31. Clean Business: a flashy corporate theme for WordPress. Whether you own a real estate business or just want a colorful theme, Clean Business is a good choice. 32. wpBusiness: wpBusiness is a company theme that is built for small businesses and startups. Clean, colorful, and very easy to keep up to date. If you are looking to go live fast, wpBusiness is a good option to consider. 33. Business Express: has a cool look and feel to it. You also get all the PSD files to make the changes with Photoshop and customize your theme. 34. CorporateFolio: a 4 in 1 theme that lets you set up your business website fast. Comes with an AJAXified contact form and custom widgets for Flickr and testimonials. 35. Kongo: comes with 9 different styles to choose from and a dynamic featured section. The built in theme options panel, available through WordPress Admin, allows you to customize this theme easily. 36. Cubicle: Cubicle is a very attractive start-up theme for WordPress. It just has the look and feel that you see with most startup websites. You can easily customize it to fit your own business. 37. Business Theme: a very good looking company theme that comes with dynamic menus and a fast script for better site performance. Easy to customize too. 38. The Axe: a dark company theme that is perfect for tech startups. You can easily change the featured image and the logo to go live fast. 39. Business Solutions: whether you are looking to start a corporate blog, a portal, or just a sales portal, Business Solutions provides you with the flexibility and convenience to get the job done. 40. Vision Business: suitable for a business, company, Blog, portfolio, or freelancer portfolio websites. You get all the PSD files too so you can customize to your heart’s desire. 41. WordPress CMS Theme: a complete business theme for WordPress that lets you get the best out of WordPress platform to set up your portal or startup page. 42. Corporate: a very traditional design for traditional businesses. Very lightweight and comes with multiple color settings. 43. The Station: The Station is a very powerful business WordPress theme that comes with 7 great colour schemes and integrated with WooThemes framework. Easy to customize and highly flexible. 44. Show Case: Show case is another attractive WordPress theme for businesses. It has 6 widget-ready sidebars, a cool Flash slide-show for the home page and two extra sidebar templates; 125×125px banner template plus the little contact list (LinkedIn, Twitter, Skype, etc.). 45. Chrome WordPress: a modern corporate theme that comes with two columns and lets you create high quality corporate websites fast. Very easy to customize. There you have it. Some of the best corporate themes for WordPress. Did I miss any? Please share. And don’t forget to let me know which one is your favorite! This really is a great collection of premium corporate-style wordpress themes. I appreciate your hard work putting it together – just saved me a good hour of digging! These look like iThemes themes. How are they different? as I am looking for additional templates — I already have the dev lic w/ithemes. thanks!